Afghan Ambassador to Pakistan Omar Zakhilwal addresses media representatives in Islamabad on May 10, 2016. The Taliban, known for its extreme Islamic rule before U.S. forces ousted the group from power in Afghanistan, have largely devolved into groups of criminals and terrorists, the country’s ambassador to Pakistan says. The change is critical as Afghanistan tries to create a lasting peace after decades of conflict and chaos. The Taliban have expanded the turf they control since the government switched its security policy to focus on protecting urban areas. And, as a military solution becomes less likely, there is a growing desire to draw the Taliban into peace talks. Before the U.S.-led invasion after the 9/11 attacks on New York and Washington, the Taliban under the leadership of cleric Mullah Omar — was best known for imposing strict Islamic law, forcing women to wear burqas, preventing girls from attending school, banning videos and music, and destroying cultural artifacts. 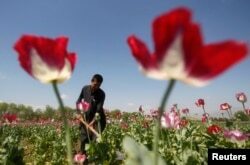 An Afghan man works on a poppy field in Jalalabad province April 17, 2014. The group also imposed a crackdown on drugs that drove the country's heroin production the world's largest — to near zero. Today, the country has made strides in catching up to the rest of the world, but conflict continues. Heroin production in Taliban-controlled areas this year hit record highs, with the proceeds used to fuel the insurgency, leading to a new U.S. offensive against drug labs. Other terror groups, like Islamic State, have infiltrated the borders and taken up residence. A place for the Taliban? Still, there is hope among Kabul leaders that some Taliban leaders can be convinced to be pragmatic and act in the country's best interest by renouncing terrorism and taking a place at the negotiating table. “The Taliban today are not the Taliban of Mullah Omar because they had some religious commitments and certain values,” Zakhilwal said. “But today, the Taliban force is a mixture of drug barons, spreading fear; some are opposed to the government on one pretext or the other; and there is a foreign hand involved as well. All these are to be scrutinized and engaged accordingly.